You can always change any summary assessment or demographic created by someone who has specifically given you the "Can Administer" permission. The Responses tab will allow you to add, remove, or change data. 1. You may need to select the School, Department, Teacher, Course or Section depending on your role. 2. 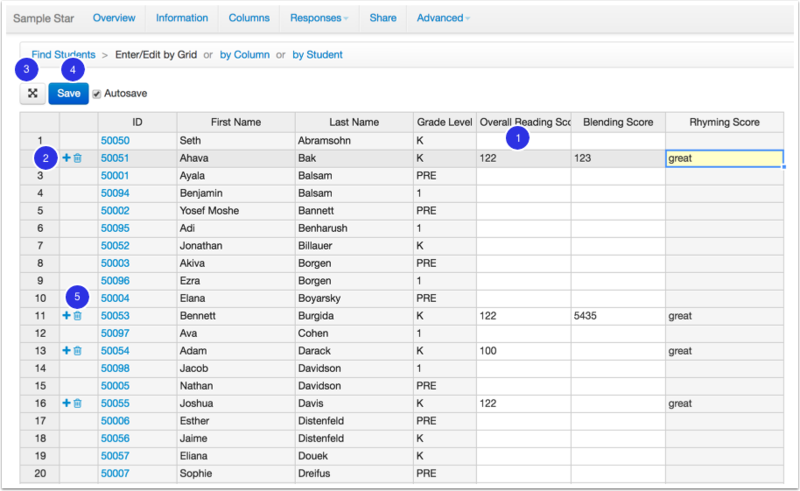 You can use View Type to select to view All Students (--), Students With Data, or Student Without Data. 2. Click Find Students to load the list of students. 1. Enter scores directly into the appropriate column. You can use your arrow keys to navigate as you might in Excel. If a pre-filled score was assigned to this column of data, an arrow featuring a dropdown menu to select will display. Fill down also works just as in Excel. A box will be highlighted in red if there is a data entry error (i.e. the data entered is above/below what has been set as the scoring points). 2. Add another column of data for a student by clicking the + sign next to their name. To delete a column of data, click on the trash can. 3. Clicking the crossed arrows will take you into Full Screen mode for data entry. 5. To Delete a line of data, click the Trash Can icon. All selected students will appear in a list to enter 1 column of data for at a time. 2. The Column Name will appear in a drop down menu to toggle to different columns. 3 & 4. Type information into the blank space and click Filldown to apply the same data to All Students or Studnets with Blanks. 5. Click into the cell next to each student to enter individual student data. 2. Toggle to different students by using the dropdown menu. 3. Enter in data for each column in the assessment for a single student. Now that you know how to manually enter data into your Summary Assessment or Demographic, learn how to Import Data into a Summary Assessment or Demographic.